Safety is one of the top priorities at our kennel. It includes not only the way we handle the dogs and work with them, a large attention is given to the safety of the dogs´s environment - the actual kennels, houses, the play yard, the feeding dishes and watering buckets, also the way we feed them and what we feed them, etc. But safety can be also applied in large scale onto training and racing equipment and other dog gear. And that is actually what I decided to talk about today. As a matter of fact, I decided to create a mini series on this topic, which will be divided into several blog posts - parts. Today, let´s talk about Visibility. Here in Scandinavia, specifically in Sweden, visibility is of a great importance and concern, when walking with our dogs, training them, biking, jogging, horse back riding, etc. It is absolutely logical - we have many months of darkness and the winter days are brutally short. Also, the traffic here is very scarce, you may drive on the long, empty roads for hours without meeting anyone, and suddenly boom, somebody appears with a dog by their side, when least expected. The monstrous timber trucks, speeding through the gravel roads better see you and your dog or horse, or in our case the entire dog team, in time! It is no surprise that Scandinavians head out for a walk equipped with reflex vests, reflex armbands, reflex hats, gloves, shoes, etc. And the very same applies for their animal companions. When it comes to other parts of the world where traffic can be crazy and life is somewhat more stressful, I believe that safety equipment for your animals is as equally, if not more, important. Few weeks ago, I received this brand new reflex and safety collar from ZERO DC (image on the right). By brand new I mean that it is one of their newly introduced products. It is adjustable and comes in several sizes. Now, we have tried and used many reflex collars on all our dogs over the years, but the problem in terms of broad visibility always remained. Their thick husky coats "hide" the collar and the reflex is visible only when you directly shine onto it with a beam of light. As you see, this collar is very wide. It may seem too wide for some of you and I agree that using it as the dogs´ main collar when mushing is not very practical. It would be difficult to put a harness over it. But, liking to play around with new things, and especially when testing dog equipment, I realized that an ideal option is to just put this collar over the dog´s regular collar, when going training or walking in the dark or nearby road traffic. Also, I often walk with a bunch of my dogs lose in the woods. In case anyone of them gets a bit further away, or in the eventual event of a dog getting lost, I can feel more relaxed about them not being shot by a hunter mistakenly taking them for a wolf, or again, getting hit by a car. These collars are very broad and visible from a distance, which is definitely their big plus. They are light for the dog to carry on their neck and very easy and quick to put on. 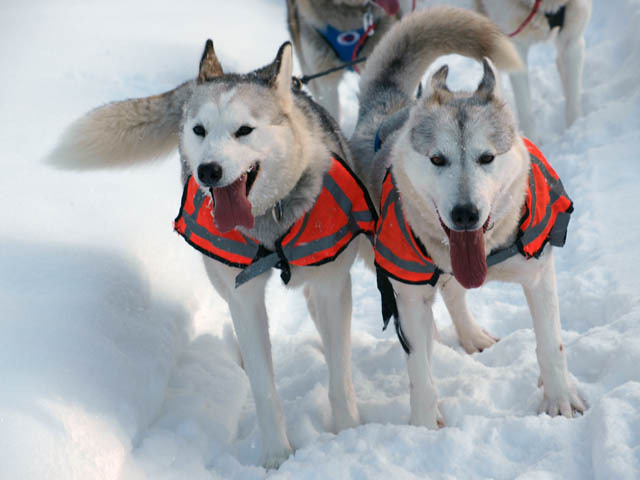 When it comes to its quality, I have an absolute full trust in it, as it is produced by ZERO DC, maker of top notch sled dog harnesses called Faster (I have made an extensive study of these harnesses and wrote about it in this article). I will talk more about these harnesses in the Safety Matters Mini Series later. I definitely like the Blizzard collar and use it now regularly when walking with Krtek (who is also the model in these pictures). I will need to order a few more for my other dogs who join the regular lose walks such as Mouse, Nugget and Sparky. If anyone would be interested in ordering some for yourself, please let me know, I can order them all at once. Another solution for good visibility are these reflex collars with side flaps. What I think is great about them is the possibility of being visible from different angles and be noticed from the side, as the flaps stick out of the dog´s neck. It is important to know the quality of these collars because if made from too soft material, the flaps won´t hold out as they should, thus losing their function. We´ve used these on our lead dogs when training our dog teams, but they have lost them at one point or another, somewhere on the trail. I find them much more suitable for walking, jogging, or biking with just one dog or two. When crossing major roads, or in other situations when you want to create that extra attention by the drivers or others around, especially when walking in the dark, I highly recommend the safety collars with built in blinking lights. We have been using this type of collars for our lead dogs while running our dog teams in the dark and in areas of frequent snow machine traffic. The better quality ones have batteries that last even during a several hour exposure to subzero temperatures. They come in different colors and sizes and as a news, some pet shops started to carry them in a set with a reflex, blinking leash. So if you wanna add an extra cautious touch, you can equip your dog with both collar and leash when walking in the dark. Reflex vests are another very practical safety necessity. They weigh almost nothing, your dog won´t even notice them on. This is another piece of equipment you´d often see on our lead dogs during training months, although most often we opt for the safety scarfs instead, as they are faster to put on and with the size of dog teams and the amount of dogs we run, we find them more practical for our own use. Although the vests cover bigger area of the dog´s body and are more visible. There are so many safety and visibility solutions on the market today. Reflex harnesses for the dogs that pull, reflex vests for hunting dogs and those we let run lose, there are also many different types of lights that can be attached to the dog´s collar or harness. Some sled dog equipment producers actually developed reflex ropes from which you can make your ganglines. When it comes to safety, I say there is never too much stuff you can equip your canine friends with, to increase the visibility. The very same counts for us - reflex clothes, or reflex vests worn over our jackets are a great solution. I wish everyone a safe autumn and winter and hope you like the Safety Matters Mini Series so far. Part II coming soon - stay tuned!